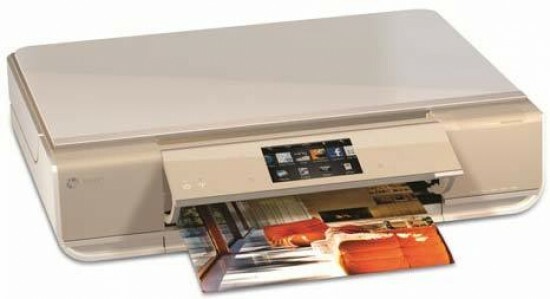 Not everyone has room for a dedicated printer and scanner, and not everyone needs to print larger than A4 in size. Enter stage left the HP Envy 110, a handsome wireless, touchscreen all-in-on multifunction printer that's designed to blend in with the rest of your home and not take up too much space or look too much like an office device. Retailing for around £250 / $250, the HP Envy 110 is quite expensive for an all-in-one, so does it offer good enough photo and scanning quality for photographers? Available in black and the more flashy all-white version that we tested, the HP Envy 110 turned the heads of everyone that saw it, which is pretty unusual for a printer. If good looks are on your wish-list then the Envy 110 won't disappoint. Weighing 15.98lb / 7.25kg, it's not too heavy, and with a very slimline profile of just 10cm in height, it also won't be too conspicuous in the home. All-in-all, this device is worthy of the Envy moniker that HP only bestows on its most desirable products. 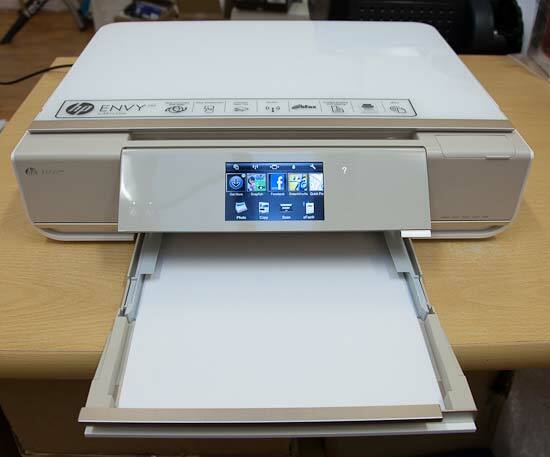 The Envy 110 has a big 3.5 inch touchscreen display on the front which automatically rises up when the printer is turned on, with the paper out-tray swinging out into position when a print job is started. Although all of this motorisation does slow down the operation of the device a little, it does ensure that that Envy 110's footprint is as small as possible when it's idle. 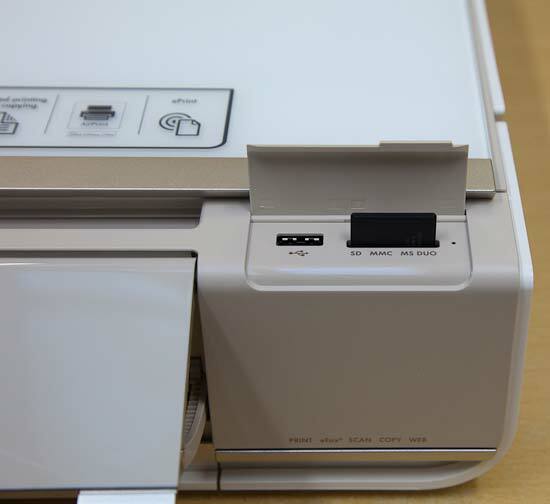 The touchscreen is surrounded by four small back-lit icons that are used in conjunction with the LCD to control all aspects of the printer's operation, with the Power and Wireless icons over to the left. In addition to the impressive touchscreen, the Envy 110 has a built-in USB port and SD / MMC / MS Duo card reader in the front right-hand corner, which supports direct connection from most cameras. Underneath is a very slim paper tray, so slim that at first you'll wonder exactly where the paper should go. Unfortunately it is a little awkward to open, and more seriously it holds very little paper (just 80 sheets of plain paper), a consequence of the Envy 110's slim design, which means that you almost constantly have to pull the tray out, fill it with paper and then reinsert it, annoying given its awkward design. 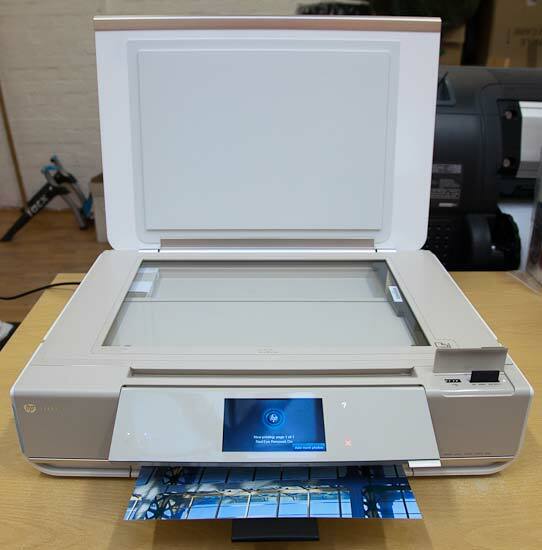 On the plus side there is an automatic document feeder for printing on both sides of a sheet of paper. 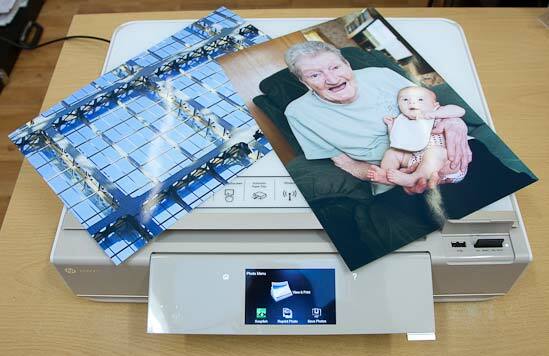 The flatbed scanner on top of the Envy 110 offers 1200x1200 dpi, good enough for accurately copying documents but not for making high-quality scans of colour photos. Text was crisp, colours were accurate and the copying speed was acceptable at around 20 seconds per document, again fast enough for light use. Print speeds aren't exactly earth-shattering, taking over 4 minutes for an A4 colour print at the highest Best quality, and over 2 minutes at the default Normal quality level. This is simply too long for a photographer-friendly printer, as you'll soon grow impatient if printing anything more than a few large prints. 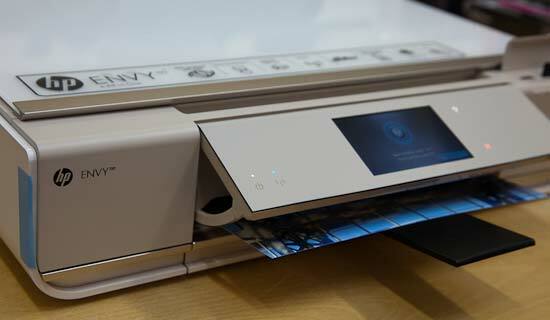 Printing over the Envy 110's wireless connection slows things down even more. A 4x6 inch print is quicker at around 1 minute, but as most photographers won't print that often at such a small size, in summary the HP Envy 110 isn't well-suited to anything other than light use by keen photographers. This is especially true given the Envy 110's print quality. It uses a single black and a single Tri-color (cyan, magenta, yellow) cartridge, and although at first glance the Envy 110 produced vibrant colour prints and commendably neutral black and white prints, on closer inspection the limitations of a 4-colour system are apparent, with a lack of fine detail in certain areas of the print and some banding evident, Like the print speeds, this probably won't put off the more casual user, but discerning photographers will want to look elsewhere.